As a restaurant owner,you should be impassioned to present a video footage of your marketing message on your menu board. Keeping this in mind, we provide an option for uploading your video. There is the “ Clean UI ” and the “ drag and drop” option to upload the video. Anybody can upload own video from hard drive with maximum 100MB in a single file. There is an option to upload a file from external source with URL. Example: If you have a file uploaded into Youtube or Vimco and wish to use the same, you only just need to upload that URL . Click on the video icon at left of the canvas. 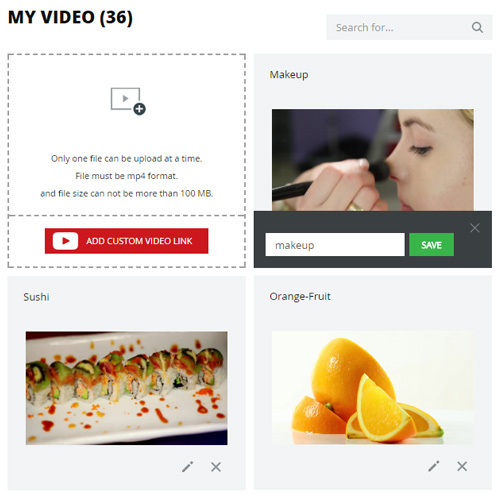 A new area will open with list thumbnails for uploaded video. Drag and drop any thumbnail to canvas area and resize it as needed.